I'm on a bit of a vanilla bean kick lately. All of the vanilla beans in my cupboard are just begging to be used! While these waffles were delicious, I could not taste the vanilla bean. Next time, I'll either add a little vanilla in addition to the bean, or add two beans. Even without the strong vanilla flavor I was hoping for, these waffles turned our beautifully. 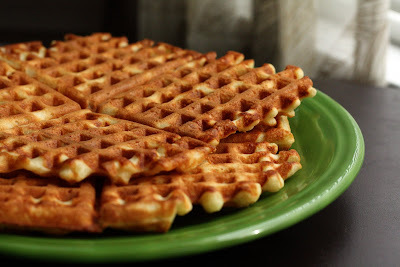 They were my first attempt at a yeast based waffle recipe (requiring some planning as the batter is made the night before), but they were quick to mix up and had a light, airy texture that most pre-made mixes don't have. I hope to someday have a belgian waffle maker - this would be the perfect batter for belgian waffles! One thing to note, the batter will have a very strong smell of yeast - however, you cannot taste it in the finished product. Combine the warm milk, sugar and yeast in a large mixing bowl. Allow to sit for about 10 minutes. During the wait, melt the butter and scrape the vanilla bean. When the 10 minute wait is up, mix in the flour & salt. Whisk the vanilla bean seeds with the 2 eggs, then add to the batter. Mix in the melted butter. Combine, but do not over beat. Cover batter and refrigerate overnight. Just before cooking, stir batter to deflate it. Use cooking spray to prepare your waffle iron. Prepare the waffles according to your manufacturer’s suggestions. Enjoy! They are wonderful with syrup or strawberries & whipped cream!